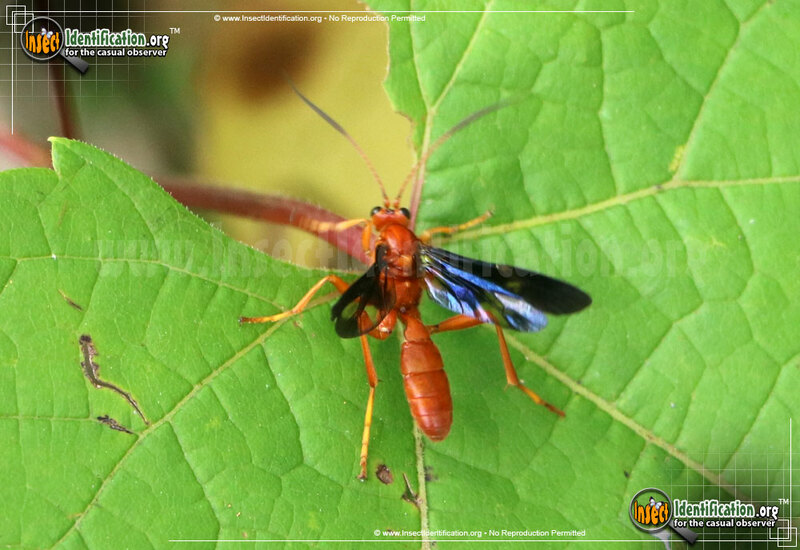 Detailing the physical features, habits, territorial reach and other identifying qualities of the Ichneumon Wasp - Trogus. This medium-sized, orange Ichneumon Wasp is a Swallowtail Butterfly's nemesis. Ichneumon wasps in the Trogus genus have shorter bodies than the eye-popping Giant Ichneumons. The orange-red color of the wasp is similar to that of Paper Wasps. This species has a more rounded bottom than Paper Wasps. Its black wings are dark, but still translucent. Legs are a lighter shade of orange. Orange antennae blacken at the tips. This type of wasp is a parasite to Swallowtail larvae. A female wasp will lay an egg on a caterpillar and it will get cocooned inside the chrysalis. There it will hatch and begin feeding on the developing pupa, killing it before it can morph into a butterfly. The mature, winged adult wasp exits the case by oozing a chemical on it that softens the inside wall enough to break out.